Data Loss Prevention is a necessity for a modern-day business to operate. Losing data can be the worst experience for business. The time taken to restore data can cost you a lot including money, customers, and reliability. Data loss happens when an individual accidentally deletes a particular file, or an external source corrupts a file. Viruses and formatting can damage your data, which might render it difficult to open on your computers. As a company, the worst mistake can be losing your files as it may affect your financial health for the longest time possible. When you lose data, you may or may not recover the data. For the recoverable data, you require an IT expert to retrieve all the lost files. However, the recovery process for iPhone and Android smartphones might take time, and resources which could be used in other things are wasted. In the end, you will discover that losing data has a standing long term consequence on your business. Once you lose some files, you may never recover them. At this juncture, such people will look for ways to prevent data loss in the future. Nevertheless, this is something they could have done long before to avoid the consequences. In this article, we have analyzed the common causes of data loss, and how to prevent it. There are a number of ways by which a user can lose their public as well as private data. Some of the leading causes of data loss are hard drive crashes, human errors, and software malfunctions. In our activities, we all make mistakes once in a while as such mistakes are unavoidable. In some instances, some of these mistakes are very big. The error happens when you or your employees delete files or parts of documents accidentally. Human beings also play a significant role when it comes to corrupting the software and formatting the hard drives. The best way to handle a human error is by offering training to your employees once they join your company. Let them know how data processing and the backup system work in your mobile app development company. In these training sessions, the employees are given an overview of the documents that backup automatically or some that require manual backup. The best solution to this is software automation and in addition to this, you can search the recycle bins to retrieve deleted files. When you mention to anyone that you have lost your company's data, the first thing that comes to their mind is virus attacks. Yes, viruses are very destructive to your software. The leading causes of viruses are emails and phishing attacks whereby an innocent employee is tempted to click on malicious links. Once they click on them, the virus gets into the computer or mobile phones to destroy or steal essential files and information. The only way to guard your computer system against malware is by installing antivirus software. However, always ensure that the software is up to date. Make it a habit of scanning your computer or mobile devices regularly to detect viruses before they perform any damage. To recover data, always back it up as many times as possible. Mobile phones are risky to log in to websites as one tends to have important information in many applications. 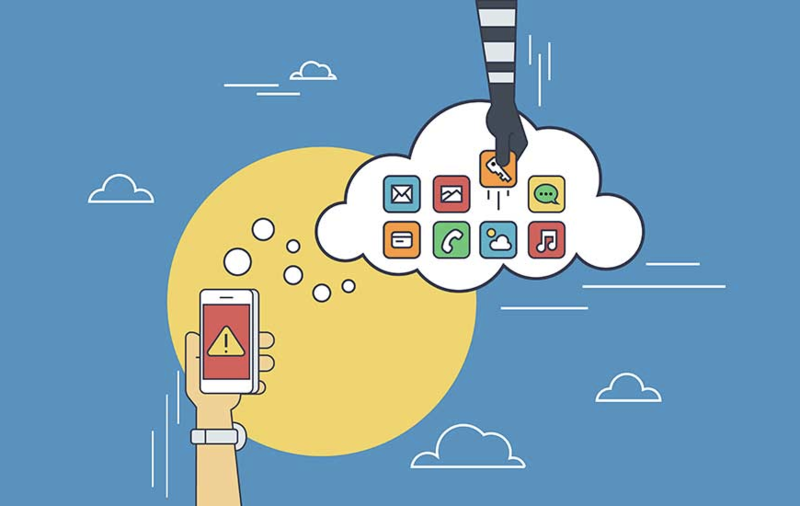 However, one can still use a mobile backup application to protect their data. 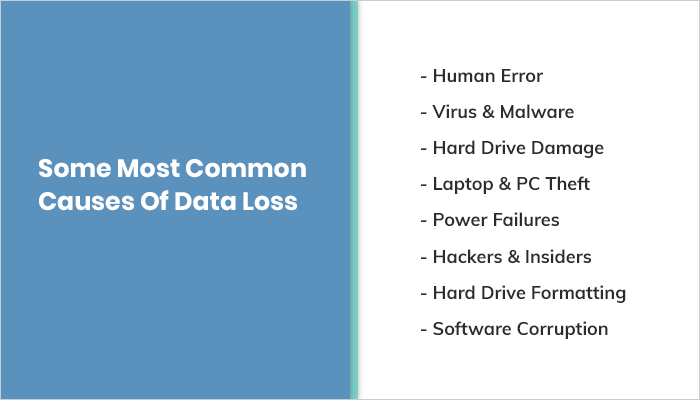 These are the leading causes of data loss. Thousands of hard drives crash every day due to mechanical breakdown or human error. Human beings facilitate the crashing by dropping the drives or jostling them in computers. In addition to this, overheated computers can cause crashing. To prevent these malfunctions, you can use SSDs instead of the traditional HDD drives as they have unnecessary moving parts. To recover lost data from crashed drives, seek the help of a professional to avoid worsening the situation. In the modern world, people are moving to mobile devices such as laptops and mobile phones in place of computers. Unfortunately, these laptops and phones get stolen once they are left unattended. Loss of laptops can result in a breach of data. To stay safe, always ensure that the sensitive information links in laptops are wiped out as soon as your employee makes access to the information. In addition to this, always use mobile back to safeguard your data in case of theft. This will help you to recover your data despite losing the laptop or computer. Another common cause that can lead to data loss power failure. For many people, it may seem like an unlikely cause, but the loss of power or a sudden power surge can also lead to an unexpected shutdown of your desktop or system. In comparison to other factors, the risk, in this case, is relatively small but that doesn't mean it should not be considered. We are well aware of the fact that Operating systems (OS) are complex and they require proper shut-down procedures to make sure that all the processes run properly and smoothly. At this point, a sudden loss of power can interrupt the entire network of delicate procedures taking place in the system. The concerns regarding cybersecurity and privacy are currently at its all-time peak, where hacking and data breaches are leading the way. Today cybersecurity has become an essential segment for brands and organizations including emerging startups, SMEs, and even Fortune 500 companies. You should be aware of the unauthorized guests accessing your network as they can further cause some serious damage to your data, for instance, they can delete or steal your private data. In addition to this, hackers can also damage your entire network and the processes taking place on it. Hard disk formatting is often included in the same category as hardware damage. Here, we are mainly talking about the accidental formatting of your hard drive which can also result in the loss of data almost instantly. For example, the employees can format their hard drive by accident if they are not familiar with the system or the content in the hard drive itself. Another cause of data loss may be due to reformatting, which is more likely to occur during system updates. In the case of accidental reformatting of a hard drive, the files and documents can be recovered in most of the case with the help of a data recovery software and other data loss recovery practices. Last but not least, software corruption is also a common cause that happens once in a while. This category mainly includes improper or unexpected software/system shutdowns which hold the capability to corrupt all of your stored data. In the majority of cases, once the software is corrupted it may not even run again. While software corruption can sometimes be the result of power outages or other uncontrollable factors, it is important to implement procedures for properly shutting down software after each and every use. So make sure to be careful when it comes to shutting down your computer and turning off any processes. Before we can begin with the explanation of why data loss prevention is important, let's start with the basics, for instance, the definition. The term DLP stands for data loss prevention and can be defined as a strategy to ensure that consumers do not send out critical or sensitive private information/data to the outside world i.e. corporate network. In other words, the term DLP is also used to recount software products and services that assist network administrator control in transferring the designated data to the end-users. Here, software products that fall under the category of data loss prevention mainly use business rules to classify themselves while protecting data that is confidential and critical in nature. This information is guarded against unauthorized end-users who are aiming to share malware to corrupt the data. We hope this data leakage definition has answered your question of 'what is data loss prevention'. Apart from this, data loss prevention i.e. DLP products are also referred to as data leak prevention, information loss prevention, and extrusion prevention products. Data loss prevention is basically a solution to identify confidential information and keep track of the data throughout the entire process while preventing any sort of unauthorized disclosure of the information by following data loss prevention policy template. Data loss prevention is very important for all companies and businesses nowadays as this also includes startups, SMEs (Small and Medium-scale Enterprises), and even Fortune 500 companies. Businesses need to keep their processes as well as employees updated with the latest data loss prevention software and data loss prevention tools to prevent data loss incidents. What Are The Data Leak Solutions? 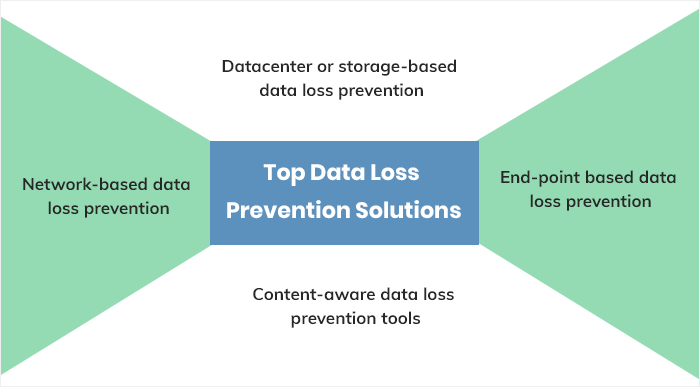 Network-based data loss prevention solutions: In this kind of DLP solutions mainly focus on protecting information when it is still in the data circulation cycle. That's one of the main reasons why these data loss prevention solutions are installed at the 'perimeter' of enterprise and corporate networks. Datacenter or storage-based data loss prevention solutions: In storage-based data solutions the focus remains on data protection with respect to an organization’s data center infrastructure, this also includes file servers, SharePoint, databases etc. End-point based data loss prevention solutions: This is another main category of DLP solutions that companies can go for, here the main objective is to monitor the PC-based systems, for example, laptops, tablets, and POS. This is done for all various actions including printing or transferring of files to CD/DVD, webmails, data transfer via USB etc. Apart from this, there are also many sources available on the internet regarding data loss prevention for different types of companies and brands. For example, Sophos data leakage software, Microsoft data loss prevention tools, data loss protection for office 365, Symantec DLP suite, Mcafee data loss prevention software, Mitsubishi DLP chip and many more. Approximately 50 percent of startups, enterprises, and companies close within two years or less of their data loss. More than 43 percent of closed companies do not even reopen again in the market. 90 percent of total companies are more likely to experience major data losses, which cannot even be recovered. More than 65 percent of SMEs (Small and Medium-scale Enterprises) tend to go out of business within 6-12 months of a data loss event. Never leave your laptops and systems unattended or without supervision. Always keep your anti-virus software up-to-date with the latest versions. Do not delete the files with whom you are not familiar, for example, system files. Keep track of your system's overheating activities and eliminate the overheating reasons. Make sure to save and backup your files on a regular basis in multiple locations. Never open emails or attachments that look suspicious in nature. You can also use a surge protector in case of high power. Make sure to create an image backup before the initial signs of hard drive failure. Apart from the above-stated points, there are some other basic things to kind in mind, for example, protect your system from any sort of liquids and keep your laptops clean and dust-free. By following these steps you are not only protecting your system by avoiding the loss of data scenarios but also taking further precautions in increasing the protection and longevity of your system. Careless mistakes give hackers a leeway to your website. A well-protected website will prove difficult to crack for hackers hence the more reason to protect it. Nevertheless, training people in basic IT skills can save your company from data loss. You can also turn to ottomatik.io offering MySQL backup for advanced data backup solutions. So this was our take on the most common mistakes in the case of data loss and how those mistakes can be prevented. We hope this article provided you with some valuable insights regarding the topic of data loss and how to avoid it. In case you still have some questions regarding the points discussed above, feel free to leave a ‘Comment’ down below and we will try our best to assist you with the same. To stay tuned for more such interesting articles, make sure to follow MobileAppDaily for trending news straight from the mobile app industry. To never miss another update from our side, all you need to do is click on that ‘Subscribe’ button.